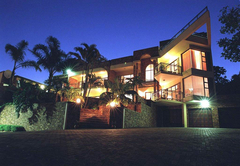 Albatros Guesthouse is a 4 star graded guest house offering Margate accommodation in 11 guest rooms. 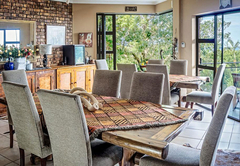 The Albatros Guesthouse is situated within walking distance of the beach and bustling village, while at the same time remains a secluded hideaway, with only the sound of birds and crashing waves, and a breathtaking, expansive 180º view of the Indian Ocean. 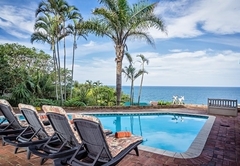 From the pool deck or from your own private balcony, you can relax and watch whales and dolphins, passing cargo ships, or merely the vastness and splendour of it all. 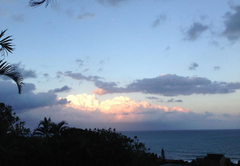 Each of our luxury, air-conditioned rooms has an en-suite or private bathroom, TV, tea and coffee, and balcony with sea view. Breakfast is served on the pool deck in the mornings overlooking the ocean ... a great way to start the day. 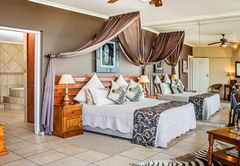 Honeymoon / Executive Suite: This room is situated on the second storey of the guesthouse, overlooking the the pool and entertainment area. 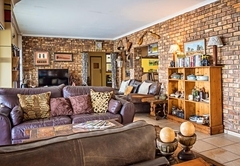 It is air-conditioned and carpeted, with plenty of cupboard space, TV with selected DSTV channels and an en-suite bathroom which includes large bath and separate shower. 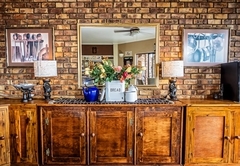 Double room with private bathroom: This room is situated on the second storey of the guesthouse, overlooking the the pool and entertainment area. 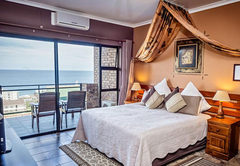 It is air-conditioned and carpeted, with plenty of cupboard space, TV with selected DSTV channels, twin or king beds, tea tray and glass sliding doors opening out onto a huge private balcony with stunning sea view. 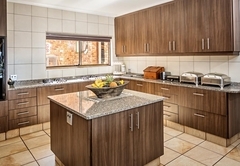 The private bathroom across the passage has bath and separate shower. 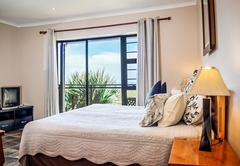 Double room with en-suite bathroom: This room is situated on the second storey of the guesthouse, overlooking the the pool and entertainment area. 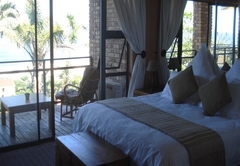 It is air-conditioned and carpeted, with plenty of cupboard space, TV with selected DSTV channels, twin or king beds, tea tray and glass sliding doors opening out onto a large private balcony with stunning sea view. The en-suite bathroom has bath and separate shower. 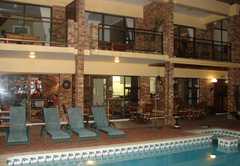 Double room with en-suite bathroom and lounge: This room is situated on the second storey of the guesthouse, overlooking the the pool and entertainment area. 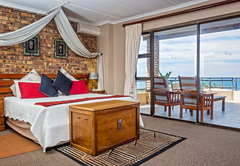 It is air-conditioned and carpeted, with plenty of cupboard space, TV with selected DSTV channels in the lounge, twin or king beds, tea tray and glass sliding doors opening out onto a large private balcony with stunning sea view. The en-suite bathroom has bath and separate shower. 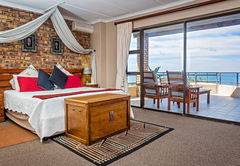 Double room with en-suite bathroom: This room is situated on the third storey of the guesthouse, overlooking the pool and entertainment area. 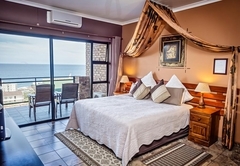 It is air-conditioned and carpeted, with plenty of cupboard space, TV with selected DSTV channels, twin or king beds, tea tray and glass sliding doors opening out onto a large private balcony with stunning sea view. The en-suite bathroom has a shower. Honeymoon/Executive suite: This room is situated on the third storey of the guesthouse overlooking the the pool and entertainment area. 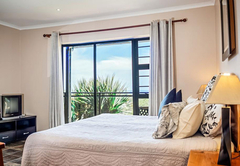 It is air-conditioned and carpeted, with plenty of cupboard space, TV with selected DSTV channels and an en-suite bathroom which includes large romantic corner bath and separate shower tray and glass sliding doors opening out onto a large private balcony with stunning sea view. Regret, no children under 12 years and no pets allowed. Smoking is prohibited inside the rooms. 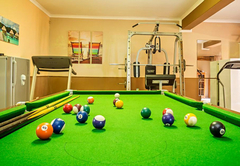 Other facilities include a sauna, Jacuzzi, swimming pool, bar, pool table and games room. If lazing around the pool is not for you, there is plenty to keep you busy during your stay with us. Sandy beaches stretch for miles along the coast of the warm Indian ocean, which offers a host of activities including safe, protected swimming, surfing, scuba diving, whale and dolphin watching boat trips, angling and deep sea fishing trips. 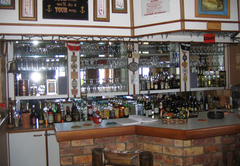 There are a host of restaurants and pubs, where you can enjoy a quick bite to eat or a leisurely evening meal. 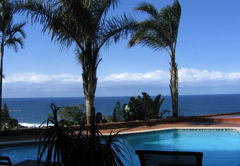 The Hibiscus Coast boasts 11 golf courses, 6 of which are voted in the top 100 in South Africa. We specialise in golf tour parties of up to 10 people. Your host will be happy to book tee-off times for you. If the 19th hole renders you unable to drive home, we provide a shuttle service to and from the golf clubs, for your convenience. For the nature lover or adrenaline junkie, the spectacular Oribi Gorge is a short drive away, where you can enjoy anything from an easy half hour nature trail or longer hikes, to the world's highest natural abseil or white river rafting in the rainy season (November to April). A visit to a crocodile farm, a flip in a microlite, gambling at the Wild Coast Casino, arts and crafts … we have it all. Child policyChildren over the age of 10 are welcome. 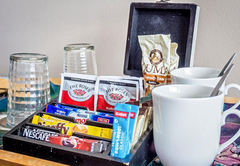 Exceptions can be made based on the composition of booked-in guests for the time in question.